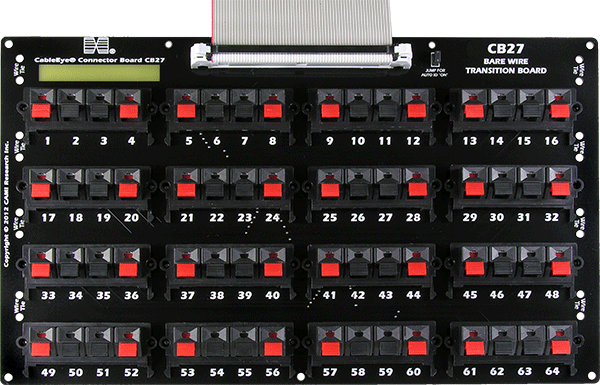 CB27 employs 16 quad Pushpin blocks to provide an interface to CableEye for cables or harnesses that terminate in bare wires. Up to 64 wires can be accommodated per board. While similar to screw terminals, the Pushpin blocks use spring-loaded levers that open easily with finger pressure and, when released, clamp down on a bare wire to hold it firmly in place. This provides very fast attachment and removal of bare wire connections. For longer-term set-ups, holes along the sides allow the use of wire ties to control wire bundles that exit from either side. Each 6.4x10.9" board, made using rugged 0.93" thick fiberglass, includes rubber feet for tabletop use. Corner holes allow the boards to be stacked or screwed down to a fixed surface. Includes an 8" long 64-conductor extension cable for direct connection to CableEye. Custom cable lengths possible with special order. 0.1" Pushpin opening will easily accept wires up to 18 gauge or one prong of a lug. Sold as a single board, not a board set.